Whilst the Scottish National team were overcoming World champs England at Wembley, Scottish clubs were having a fine 1966-67 campaign highlighted, of course, by Celtic. Celtic had enjoyed a fine summer in 1966 with a pair of wins against Spurs and a 4-1 beating of Manchester United the highlights of a 12-match unbeaten run in preparation for the season. 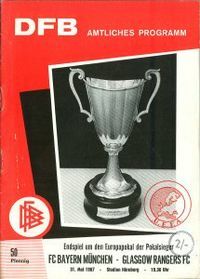 The Glasgow Cup was the first trophy pocketed. Celtic travelled to the home of their fiercest rivals Rangers and in front of over 76,000 fans, beat the hosts 4-0 thanks mostly to a fine hat-trick from Bobby Lennox. The club continued to sweep all before them in Scotland and in fact, the only matches they lost in domestic competition all season were the two league encounters with Dundee United who finished way down in ninth place. Aside from that the Hoops swept all before them finishing three points clear of city rivals Rangers and scoring a whopping 111 goals while conceding only 33. In the League Cup, Jock Stein’s men raced through their group, winning 6 out of 6 and scoring 23 goals including an 8-2 win over St Mirren and a 6-0 thrashing of Clyde. This led to a quarter-final clash with Dunfermline Athletic and a 9-4 aggregate hammering. Airdrieonians were comfortably taken care of in the semis, 2-0, which set up a final where the opponents were Rangers once again. In front of a Hampden crowd of 94,532, a Lennox goal proved enough to clinch the trophy with the team scoring 35 goals in 10 matches, conceding just seven. The Scottish Cup featured one of the biggest upsets in the history of the tournament when Division Two Berwick Rangers overcame Rangers thanks to a Sammy Reid goal at Shielfield. Berwick, the only English team plying their trade in Scotland, couldn’t repeat their feat in the second round where they fell 1-0 to Hibernian. Celtic were again thrashing the opposition, albeit teams from the lower ranks. Arbroath, Elgin City and Queen’s Park were seen off by a combined score of 16-3 to send them into the semi-finals. There, Clyde who enjoyed a fine League season themselves, held the Celts to a goalless draw but four days later Jock Stein’s men ran out 2-0 winners in the replay to set up a final clash with Aberdeen. 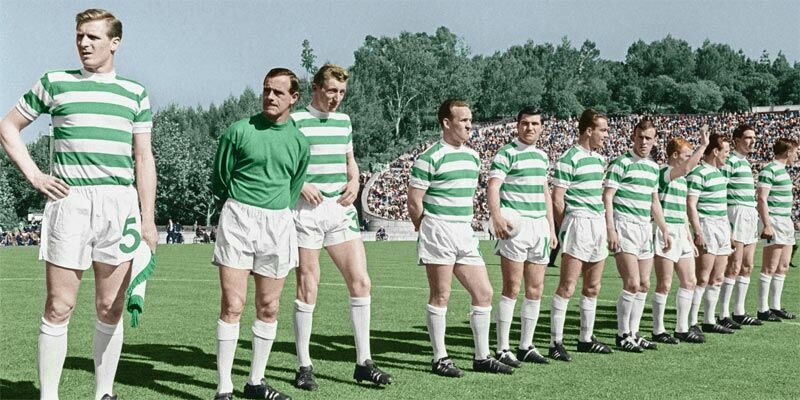 Having reached the European Cup final just four days before with a goalless draw against Dukla Prague in Czechoslovakia, Stein delayed naming his final line-up until the night before the match. When the team was announced it was ‘business as usual’ with the XI that had earned a place in the European final stepping out at Hampden In front of 126,102 fans. 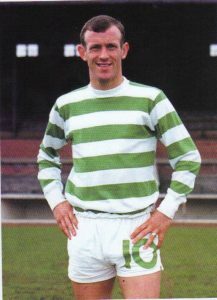 Hero of the day was Willie Wallace who scored both goals in a 2-0 win, having been set up first by Bobby Lennox and then by Jimmy Johnstone. Veteran ‘keeper Ronnie Simpson was particularly emotional after the final whistle and he was later name Scottish Footballer of the Year. 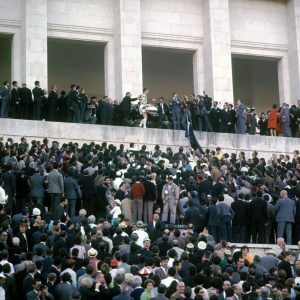 Despite the domestic clean-sweep the undoubted pinnacle of Celtic’s season was when they were crowned champions of Europe in Lisbon on May 25 1967. The European quest began with a tie against F.C. Zurich. The Swiss team were very physical in the first match at Celtic Park with Jimmy Johnstone in particular coming in for some rough treatment. It took 64 minutes for the home team to make the breakthrough, Tommy Gemmell rifling home off the underside of the bar. Five minutes later Joe McBride added a second and it looked like Celtic had secured a 3-0 win when McBride scored again but the referee blew for full time as the ball was entering the net and the ‘goal’ was chalked off. The Swiss side promised Celtic a tough time for the second leg, played on Jock Stein’s 44th birthday but the team provided their manager with a good present, winning 3-0 with two more goals from Gemmell and a third from Stevie Chalmers who was preferred to McBride for the return. In the second round the Scots were drawn to play French champions Nantes with the first leg away from home. Celtic began the game well and Johnstone, given the nickname ‘The Flying Flea’ by the French press, hit the bar early on but it was the home team who took the lead when Francis Magny scored after 17 minutes. Seven minutes later McBride equalised and although the French team pressed to retake the lead Simpson and his defence held out. In the second half, on a heavy pitch, Celtic’s superior fitness began to show and goals from Lennox and Chalmers effectively sealed the tie with the second leg still to be played. The day before the second leg the club completed the signing of Willie Wallace from Hearts for £30,000 but he was not eligible for the tie (or in fact for the quarter final) which was won comfortably by the same score as the first encounter, the goals coming from Johnstone, Chalmers and Lennox with Georgin claiming the solitary strike for the visitors. In the quarter-final Celtic were drawn to play Vojvodina Novi Sad and, after the tournament had enjoyed its customary winter break they travelled to Yugoslavia for the first leg on March 1. It was a disciplined defensive performance by Stein’s men and it took a rare lapse from Tommy Gemmell to give their hosts, coached by Vujadin Boskov who would go on to have a long and illustrious career, a chance which was well taken by Milan Stanic. So, Celtic returned to Glasgow with a deficit to overcome. A week later, in front of 69,374 fans they almost conceded what what have been a crucial goal after just five minutes when Pusibric missed a great opportunity. They probed throughout the remainder of the first half but failed to break through a well-organised defence. Tactical changes at the break unsettled the visitors and after 58 minutes Chalmers pounced on a goalkeeping fumble to level things on aggregate. The home team piled on the pressure but Vojvodina held out gamely. The teams looked all set for a playoff in Rotterdam until, in the 90th minute, Billy McNeill rose majestically to head home from a corner to send Celtic through and the crowd wild. Vojvodina boss Boskov, whilst claiming that his goalkeeper was fouled just before the winner was scored, praised the opposition saying; “They must have a great chance of going on to win the cup”. Celtic thus became the fourth Scottish team to reach the semi-finals of Europe’s premier tournament, following in the footsteps of Hibernian, Rangers and Dundee. Standing in their way of making the final were Dukla Prague, the champions of Czechoslovakia. 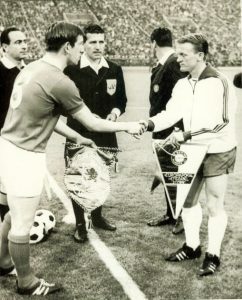 The team of the Czech army had seen off Ajax and Johan Cruyff, themselves conquerors of Liverpool, to reach the last four whilst the other semi paired Inter with CSKA Red Flag (Sofia). The first leg of Celtic’s third European semi in four years (they had reached the Cup Winners Cup last four twice) was played at home in front of 74,406 fans and Wallace, finally eligible, paid off his £30,000 fee in one go with two of his team’s three goals. Jimmy Johnstone gave the Hoops the lead – arguably against the run of play – after 27 minutes before Strunc pulled the visitors, inspired by 36-year-old Josef Masopust, level just before half time. Wallace then grabbed his brace and was denied a hat trick by the crossbar so Stein’s men settled for a two-goal lead to take to Prague. Stein insisted that his team would defend in the second leg with the onus on Dukla to score two goals in order to qualify. He gave Wallace the task of marking Masopust. After some early attacking forays the visitors focused on defence and although the Czechs controlled possession they rarely threatened Simpson’s goal. The final whistle came and Celtic celebrated as the march to Lisbon was complete and they became the first team from Scotland, indeed from the United Kingdom, to reach the final of Europe’s premier competition. 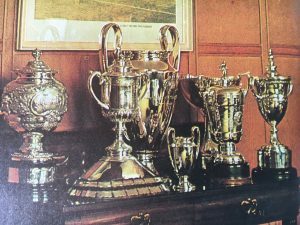 So, with the Glasgow Cup, Scottish Cup, Scottish League Cup and Scottish League title all safely back in the Celtic Park trophy room, the team headed off for Lisbon and Thursday May 25 1967; their date with destiny. 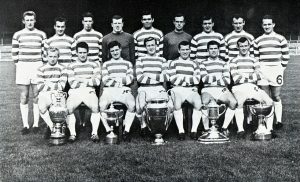 Jock Stein would certainly need to prove his tactical nous as the team took on Inter and their catenaccio style which had seen the side win two of the previous three European Cups and suffer a solitary defeat, a 1-0 loss to Real Madrid, in their previous 42 games in the continent’s toughest competition. Could they be beaten by a team of local lads all of whom were born within 30 miles of Glasgow? Four days before the game Inter suffered a blow when it was announced that star striker Luis Suarez would be absent due to a torn cartilage. But the Italians were still hot favourites and the vast majority of observers and ‘experts’ gave the Scots little chance. Stein’s words to his players prior to the game were; “If you’re ever going to win the European Cup then this is the day and this is the place. “But we don’t just want to win this cup, we want to do it playing good football – to make neutrals glad we’ve won it, glad to remember how we did it”. The Celtic players walked onto the pitch singing the club song but all predictions of an Italian victory seemed to be confirmed after just seven minutes when Jim Craig was somewhat harshly adjudged to have committed a foul in the box and Sandro Mazzola slotted the resultant penalty past Ronnie Simpson. Anyone expecting capitulation sorely underestimated the fighting spirit, and indeed skill, of Stein’s men. The one-goal deficit acted as a further spur, as if it were needed, and they took control peppering the Inter goal and going close to scoring on numerous occasions. Celtic had 42 attempts on goal, with 24 on target compared to Inter’s 5 (4 on target) and won 10 corners whilst the Italians didn’t manage one as the Scots heeded Stein’s pre-match battle cry of ‘we must play as if there are no more games, no more tomorrows’. Still, it took until the 63rd minute for the equaliser to come. Amd it was Gemmell who proved to be the hero, blasting home from 20 yards. With six minutes remaining, Gemmell was involved again, setting Bobby Murdoch up to strike at goal. Murdoch’s shot was diverted into the net by Steve Chalmers. The games was over, the trophy was Celtic’s. Inter had been run into the ground by their opponents and had nothing left to give. The win was lauded by all. Even opposing manager Helenio Herrera was moved to say after the match; “Celtic deserved to win. We lost the match but it was a victory for football”, whilst all Liverpool manager Bill Shankly could say was; “What a performance, what a performance”. The team returned to Glasgow, and to a heroes welcome. The 11-mile journey from the airport to Celtic Park was packed with fans and another 50,000 waited for the team to arrive. The fans celebrated with the team. A remarkable season was over, and Stein would forlornly ask; “what do I do next year?”. It was such an amazing season both at home and on the continent for Celtic that it tends to be overlooked that two other Scottish teams also had fine European campaigns. Rangers competed in the European Cup Winners Cup and started off with a tie against the Belfast team Glentoran. After securing a 1-1 draw in the away leg at the Oval, the return resulted in a comfortable 4-0 win for the home team. Things got much tougher in the second round when the men from Ibrox were paired with holders Borussia Dortmund who had conquered Liverpool in Glasgow to win the competition a year before. After taking the lead through Kai Johansen in the first leg in front of 65,000 at Ibrox, Rangers were pegged back by a controversial equaliser when Siggi Held left the pitch but came back on to provide the pass from which Trimholdt scored. However they got a winner in the second period when Alex Smith converted a Willie Johnston cross. Scott Simon’s men then battled to a goalless draw in Germany to progress, despite playing with 10 men for 52 minutes following an injury to Bobby Watson. Next up we’re the Spaniards of Real Zaragoza, the tie coming on the heels of that shock Scottish Cup defeat to Berwick Rangers. Dave Smith and Alex Willoughby gave Rangers a fairly comfortable first leg win but the return was lost by the same score forcing the tie into extra-time. Smith missed a penalty in the extra period and progression was decided by a coin toss. Greig had called correctly twice on the night, both at the start of the match and the start of extra time and he completed the hat trick when rightly calling tails to see his team through by the chanciest of methods. The semi-final was against the Bulgarians of Slavia Sofia and there was to be no repeat of previous dramas with a single-goal win in the away leg and victory by the same score in the return. 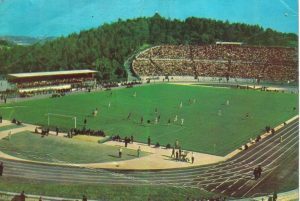 Davie Wilson gave the team victory in the Bulgarian capital and 70,000 fans turned up for the return where Slavia ‘keeper Simeon Simeonov had a great game and was beaten only by a Willie Henderson strike. So it was back to Germany, this time Nuremberg’s Stadtisches Stadium, for a clash with Bayern Munich, just days after Celtic had completed their memorable run to European glory in Lisbon. So it was into extra-time and in the 109th minute Franz Roth got the only goal of the game, lobbing Norrie Martin to give Bayern the trophy, cheering the majority of the 70,000 fans and denying Glasgow the remarkable feat of winning both major European trophies in the same season. 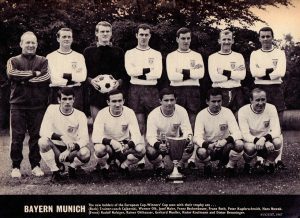 The third European competition was the Inter-Cities Fairs Cup and in this, Scotland had three representatives. Dunfermline Athletic entered the tournament in the first round and comfortably saw off the Norwegians of SK Frigg was 3-1 wins both at home and away. So Dunfermline went through to the second round where they were joined by Dundee United and Kilmarnock, both of whom had been given byes. In the second round Dunfermline were somewhat unlucky as they recorded a 4-2 at home to Dinamo Zagreb but were then beaten 2-0 in the away leg and were eliminated on away goals. Meanwhile Dundee United recorded an impressive 4-1 aggregate win over Barcelona whilst Kilmarnock hammered Royal Antwerp 7-2 at Rugby Park after winning the first leg in Belgium 1-0. So two Scottish clubs remained in the last 16. Dundee United were drawn against Italian Giants Juventus and, after losing 3-0 in Turin, won the second leg but a solitary goal was not enough to overturn the first leg deficit. 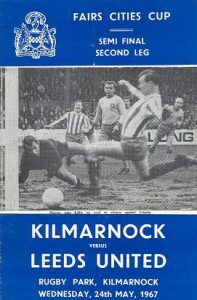 Kilmarnock were again given Belgian opposition and they needed extra time goals from McInally and McLean to see off Gent (then known as Le Gantoise) 3-2. And then there was just the one Scots side left. 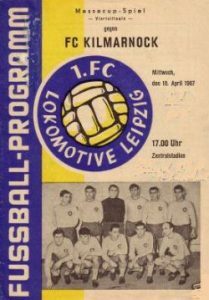 The quarter-final saw Kilmarnock paired with Lokomotiv Leipzig and they turned things around after a 1-0 defeat in East Germany (where Gerry Queen was sent off), winning 2-0 at home to make it through to the last four. Brian McIlroy again proved the hero, scoring the second half goal that sent Killie through. Sadly the fairytale run for Killie came to an end in the semi-final where a 4-2 deficit from the first leg (indeed the first half) at Elland Road, fuelled by a hat-trick from Rod Belfitt which included two inside the first four minutes, could not be overturned in the second game. Amid reports of a mass transfer request from the Kilmarnock players due to unpaid bonuses the visitors focused on not conceding and comfortably held their hosts at bay as the teams fought out a drab goalless draw. So Killie failed to make it three Scots clubs in European finals but it was a glorious failure. The eventual winners of the competition were the Dinamo Zagreb side that had overcome Dunfermline in the second round. They got the better of Leeds in a final, amazingly played at the start of the following season by a 2-0 aggregate score. So, all-in-all, an amazing European season in club for Scottish football, Celtic’s dominance being the clear high-point. Allied to the national team’s win over World Champions England at Wembley things couldn’t have gone much better. The only dark cloud among all the brightness was the demise of Third Lanark who were wound-up in the high court in June 1967 following mismanagement and asset-stripping by those in authority at the famous old club. But that I e blemish cannot remove the fact that, for one season at least, Scottish football ruled Europe, and Scotland ruled the world.